Premium 100% cotton ash / light grey tee. 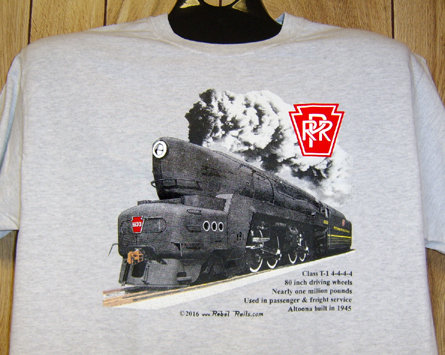 Massive Pennsylvania Railroads 4-4-4-4 steam locomotive with shark nose design. There is a movement to build a NEW T-1; check: http://prrt1steamlocomotivetrust.org/ Click on image for zoom.